CTM Products in currently the only manufacture to produce accessories that will provide you with a semi-custom cart for 'B" miniature horses. Contact Us for more info. The lift kit raises the cart four inches making the cart taller. 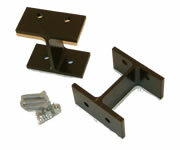 The kit attaches directly to the axle and raises the framing, seat and shaft. This allows for a better fight for the “B” minis. 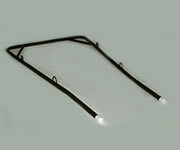 For the miniature carts, we recommend purchasing the 54" shaft (below) in conjunction with the Lift Kit. Fits both Miniature Carts and Pony Carts. Steel Shaft used for holding your horse to your cart. 19" wide at the open end and 54" long. 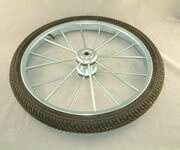 24" diameter rugged wheel for use on pavement, groomed arena, light grass or fields.